No Hockey Tonight. Is Something Else On? - Blather. Rants. Repeat. No Hockey Tonight. Is Something Else On? That was apparently taken at Eleanor's store, and they stopped selling them on Friday. I've seen comments, both on that piece and elsewhere, suggesting that the "promotion" was shot down by Wegmans corporate, since they have at least one store in eastern Massachusetts and wouldn't want the viral attention from something like.... oops. Wake us when it's all over. love the deflate cake! 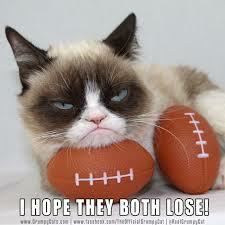 and i have to agree with grumpy cat too.